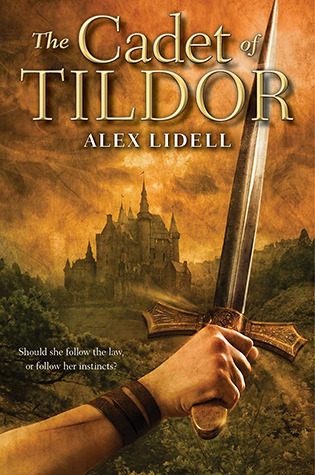 I am so excited to be part of the tour for The Cadet of Tildor today and welcome Alex Lidell herself to join us today and share some interesting facts about her debut! You can check out the other tour stops HERE. You can find The Cadet of Tildor at Amazon, GoodReads, and its Official Website. Alex Lidell is a YA fantasy writer and author of ABNA Finalist THE CADET OF TILDOR (Penguin, 2013). Although English is Alex’s primary language, it wasn’t her first. Coming from Russia, Alex learned english in elementary school and fell in love with reading when the school librarian put Tamora Pierce’s ALANNA into her hands. Years later, in college, it was another book that re-united Alex with russian, which she had shunned in adolescence. The Three Musketeers. * Alex thanks both books, and the writers who created them. Beyond writing, Alex is also a photographer, a horseback rider, and a paramedic. The latter two go hand in hand more often than one would like. She is trying to self-teach herself and her horse to sword-fight. Alex would love to see THE CADET OF TILDOR in the classroom and is working on developing teacher guides for the novel. She enjoys “e-meeting” both students and educators. You can find out more about Alex Lidell and her novel at Twitter, Facebook, GoodReads, Shelfari, and Library Thing. 1) Despite its problems, Tildor has the strongest and most prosperous economy of all the neighboring nations. Commerce forms Tildor's economic backbone. 2) Cory, Savoy's younger sergeant, was a thief before joining the military. 3) Davis, Savoy's older sergeant, used to be in charge of Savoy during Savoy's own field internship as a cadet. 4) Connor Seaborn is an awesome soccer player. 5) Tamora Pierce's SONG OF THE LIONESS and PROTECTOR OF THE SMALL inspired this book. Tammy's wonderfully simple and visual prose is my gold standard. 7) Before he become a High Constable and the Academy Headmaster, Verin was one of the best sword fighters in Tildor. 8) The next book in the series will either follow Renee's progress, or jump pack to detail Savoy's field internship as a cadet. Both stories are in the works. 9) When they were cadets, Seaborn did most of Savoy's homework. 10) A scene cut from the original draft included a direct, secret confrontation between Headmaster Verin and Lord Palan. Awesome post, Keertana ♥ Thank you for sharing it with us! I haven't heard of this until now, K, but if it gets your stamp of approval then I am interested! It's been ages since I've read any straight up fantasy, too! Ooooo this sounds good Keertana! Typically fantasy is a tricky genre for me, but it's been growing on me more and more lately. I'm starting to branch out from my strictly paranormal reads - vamps, weres, fairies - to other things and I'm loving it. Also, her horse is beautiful, makes me miss riding! This one is on my TBR list already - can't wait to give it a read! Interesting post, Keertana! I was slightly interested in reading this when the trailer was revealed (even if the trailer was PAINFULLY cliche), but after I saw your review I figured it wasn't for me. I'm not much of a fan of high fantasy to begin with *ducks* so I'm pretty sure this wouldn't go very well for me. Great post, Keertana. :) I tend to stay away from high/traditional fantasy - it's just not of those genres I mesh well with, really - but I liked how this book was inspired by Tamora Pierce's Song of the Lioness Quartet! I love those books. I'm a pretty big fantasy person, although I haven't picked up nearly as many high fantasies as I want to, so I'm excited to read this one! I love some of the fun facts, like the one about where the author gets her fighting moves inspiration from. Most of these facts, however, are ones I'm going to have to come back to after reading the book, since the characters names are pretty unfamiliar. I really want to read this book! I just love fantasy! I loved the fact that the characters are not perfect; they have flaws and despite being a fiction book, the characters are real. I had pretty high expectations going in. The blurb compares the book to Tamora Pierce and George R. R. Martin's works, which in my opinion gives it some pretty big shoes to fill. So, suffice it to say that I was hoping to be blown away by The Cadet.